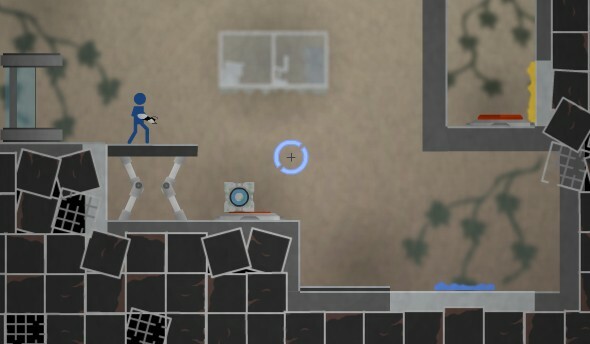 Portal 2D is a platformer puzzle game from sims5000. It was created as a tribute to Valve's popular console puzzle called Portal 2. This 2D game uses almost every feature of the original 25 epic levels. So if you are a fan of the original then chances are you will appreciate this one too. For those who are not familiar, this game is played using [WASD] or arrow keys for moving the character around, [Q] to shoot primary, [E] for secondary, [F] to use or interact with object and [K] to restart. By the way, the story line of this game is a bit different from the original one. Your quest here is all about chasing a delicious looking sandwich. Meanwhile, here is Portal 2D walkthrough showing gameplay completion and solution for all levels.